Art is immortal and so are the artists and their muses. 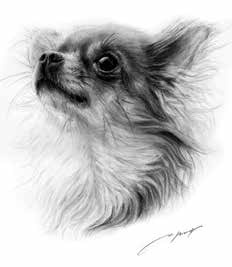 Dog lovers across the world get their pooches immortalised through portraits and sketches. 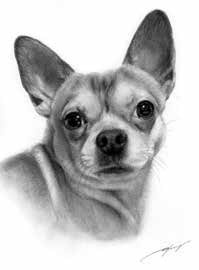 Here are five artists who sketch dogs and their work is so real that their drawings look lifelike portraits. Danguole Šerstinskaja is winner of American Art Awards ‘Realism Animal’ decided by 25 of the best galleries in America. She undertook education in an art school in Lithuania. “I started sketching in my late teens. 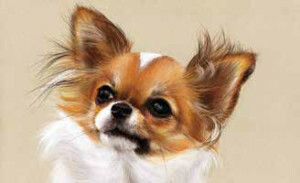 I’m a dog breeder with decades of experience and my whole life has been revolving around animals,” she says. Kevin Hayward from England started sketching when he was little. “I was probably about 8. I used to draw cartoon characters”, Kevin remembers. Kevin has not done any formal education in art. “I have only studied art between the ages of 11-16. Anything after that I have learnt by doing and making loads of mistakes!” he adds. decided to go on to college and do it as an A level. But I didn’t want to carry on to university with it as it wasn’t my sort of art that they encouraged at college, it was more expressive, they didn’t like the little details that I pride myself on,” she recalls. Talitha Spaink from The Netherlands started sketching/drawing in the Spring of 2014. “I never attempted drawing before. But in all honesty, I do have creative parents, so it must be in my DNA,” she says. So, Talitha never had any schooling or training in drawing. “I am also the type of person who doesn’t read manuals either; I love finding things out for myself without someone else telling me what to do,” she remarks. Andrew James Holmes from England is a self taught, freelance artist, who specialises in graphite pencil drawing. “From as early as I can remember, I have always loved drawing. Though I enjoyed art at school, I didn’t follow it on into higher education, instead continuing drawing as a hobby in my spare time. I am self taught as I learn from each drawing, developing my techniques and level of detail,” he asserts. For Kevin it started with his love for animal. ”I love animals, so initially I drew a few wild animals such as giraffe and zebra. 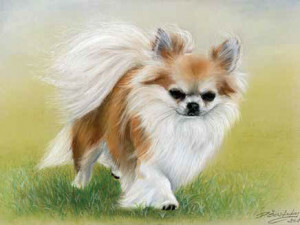 Then I was asked to draw someone’s dog and it started from there! I also draw people, wild animals, cars, jets, divers, judges… I’m asked to draw all sorts of things!,” he says. “My favourite artists are Alfred Bierstadt, Ilya Repin, Dirk Dzimirski, Darren Baker, among others,” says Danguole. Talitha is a huge fan of Monika Paruzel’s work. “She makes huge paintings of dogs. I simply love her style! Apart from her, there are tonnes of people who inspire me to keep improving my skills,” she points out. 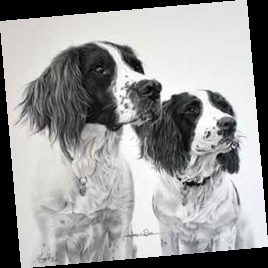 “I want to display the animals in depth and through patience and concentration I produce lifelike portraits,” says Danguole. “My inspiration comes from my love for animals and my passion to create. I love to see everyone else’s pets, and to hear stories about them, which makes doing pet portraits even more fun as you get to know the animal, even though I’ve never met them. It can also be quite a tough job as some people are looking to get memorial portraits done, I always feel very honoured when I get asked to do them but it is sad to hear that they have passed away. It’s never an easy thing to deal with when you lose a pet, they are part of the family. Which takes it right back to being an important job too, to help preserve those happy memories that we should cherish,” says Willow. “My inspiration comes from knowing that someone will have my artwork, pride of place in their homes,” tells Kevin. While Talitha says that her Great Dane Noa is her inspiration. “She is my muse and I will never ever get enough of drawing her!“ she concludes. (With inputs from Danguole Šerstinskaja, Lithuania (www.petdrawings.net); Kevin Hayward, England (www.kevinhaywardart.co.uk); Willow Homer, England (www.willowtreepetportraits.com); Andrew James Holmes, England (www.capturedinpencil.co.uk); and Talitha Spaink, Netherlands (www.artbytalitha.com).